Här är vårt utbud av guidade turer och utflykter på Ilha Grande i Brasilien. 1. 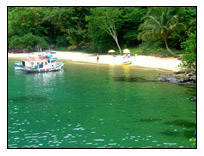 Lopes Mendes – considered as the most beautiful beach of the island, about 3 kilometers long. 2. 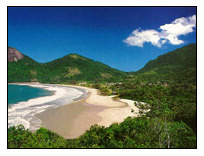 Saco de Céu – located in a bay with calm waters and scenery with hills and rainforest. 3. 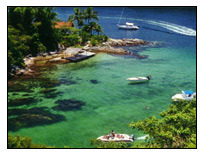 Lagoa Azul (Blue Lagoon) – due to its transparent waters in a huge natural pool, it is the best place for diving and snorkeling. 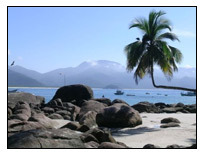 The Town Dois Rios was headquarters of the famous and feared Prison of Ilha Grande. Leave Abrao and walk on a dirt road with light rise and where rarely vehicle pass. In two hours you get to Dois Rios. The entire trail is surrounded by beautiful landscape views of the Continent and Abrao village below. At the entrance of the town, imposing palms mark which was ones a prosperous village. The place is cozy and friendly. The beach is wide and calm and in each end of the beach, are freshwater rivers that gave the name to the place, Two Rivers! Time for a swim in the river and the clear waters of the sea. Return to Abrao. 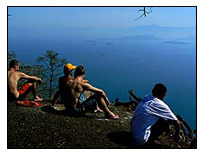 With about 900 meters of hight, the “Parrots Peak ” has one of the best views of the island. This trek is for those with good physical conditions. From Abrão village an easy ascent on the road that leads to the Dois Rios beach. 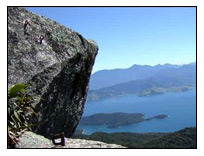 After some 40 minutes begins a trail that leads for about 2:30 hours up to the top of the Pico do Papagaio Mountain. 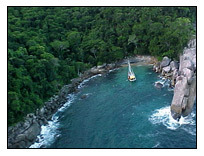 From the top, you have a panoramic view of almost the entire island of Ilha Grande. Return to the hotel. Departure for a trekking tour with a guide to the Caxadaço Beach, one of the most charming beaches of the island with clear water. Protected from the open sea, served as a hideout for smugglers in the past. Access by a trail of stones made by slaves from Two Rivers. Duration: 8 hours. The waterfall of Feiticeira is an interesting trek because it is a fast course, with rises and falls inside the rainforest. Leave Abrao following the path to the ruins of the aqueduct and from there take the path towards Saco do Ceu and in the beginning is a long climb, but the waterfall is not far away. You can reach it in two hours. Time at leisure. Return to Abrao. The Trekking Adventure around the island of 5 days and 4 nights, is with walks of in average 6 to 7 hours a day and led by local expert guide. The overnights are in hostels and local houses, with some meals included. Maximum of 10 participants. Day 1 - Leave at 10:00 from the town of Abrao to Bananal. Overnight in a hostel in the bay of Bananal . Including breakfast + one more meal. Day 2 - Leave at 08:00 to Araçatiba. Overnight in a hostel on the beach of Araçatiba . Including breakfast + one more meal. Day 3 - Leave at 08:00 to Aventureiro. Overnight in a local house on the beach of Aventureiro . Including breakfast + one more meal. Day 4 - Leave at 09:00 and by boat to Parnaióca. Overnight in a local house in Parnaióca. Including breakfast + one more meal. Day 5 - Breakfast. Leave at 08:00 to Pouso. Return to Abrao village by boat.